7 Actions of a Billion Dollar Agent – Client Marketing – What is a Past Client? A past client is the real estate industry term for a person who has had a transaction with you and that transaction closed. Thus, they are now a ‘past client’. That phrase is costing you, almost all real estate agents, and even most Billion Dollar Agents a significant amount of money. Words can kill and the word ‘past client’ kills your profits. Why would anyone care about a past client? Why would you even think of investing any money in a past client, or even your time and energy? Well, past clients are the most profitable part of your business and the only asset you have if you ever wish to sell your business. The valuation of a real estate practice is closely connected to the percentage of business that is from existing clients versus new clients. DELETE THE WORDS “PAST CLIENTS” FROM YOUR MIND! You have clients. They are your biggest asset. 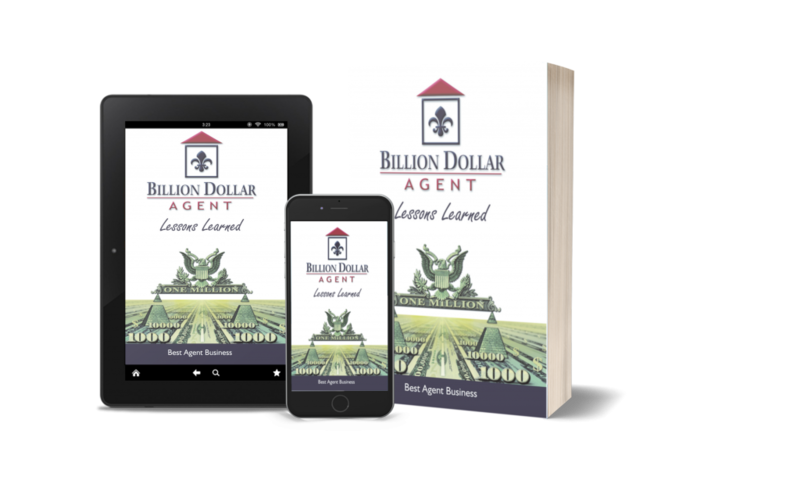 This is one of the biggest lessons of Billion Dollar Agent – listen closely. Billion Dollar Agents achieve from 20% to 80% of their business from current clients. We strongly believe that the agents with the higher percentage of business from current clients are much more profitable than agents in the lower ranges. A person becomes a client when they sign a listing agreement. If you fail to sale their house, or get fired, you just lost a client. A person becomes a client when they sign a buyer agreement and, hopefully, you have taken a buyer fee (such as $595) to be reimbursed by the seller at closing through your skillful negotiation. If you are driving around a buyer without a signed buyer agreement, you are not driving around a buyer, you are driving around a prospect. When a client has a house listed with you or you are showing them homes to buy, they are an active client. So, you may have 100 clients after a few years and about 10-20 of them are active at one time. When a transaction is closed, they move from Client – Active to Client status. • Fired client – closed a transaction. But, you decide never to do business with them again because they are toxic. Fire toxic clients. It will make you very happy. You should operate your business to have 50% or more of your clients as testimonial clients. On average, it seems that 10% of clients become referral clients for the agents in this book. Imagine that you have a $200,000 GCI and are spending 20% or $40,000 on marketing. Your business is 30% existing clients/referrals. You spend close to nothing of the $40,000 on clients. If you had average commission of $10,000 and 20 transactions, then you had 70% or 14 transactions were new clients for $140,000 and you spent $40,000 to acquire them. Thus, you actually spent close to 30% on marketing for new client acquisition. If your average commission is $7,000 and your average client has a buying or selling transaction every 7 years, then each client is worth $1,000 per year in GCI. Thus, if you lose a client, you just lost $1,000 every single year for the next 10-30 years. This is big – huge – bigger than big. Billion Dollar Agent developed a business model with spreadsheet and analysis to help you analyze your client base and the value of each client. We have a few different versions for different size businesses. Just send an email to steve.kantor@billiondollaragent.com, include your current number of clients, transactions and dollar volume closed last year, and the percentage of last year’s business that was client repeat/referral.